HULU, Netfix, Youtube, Google movies – the list is never ending. When we say never ending we have to keep it that way. 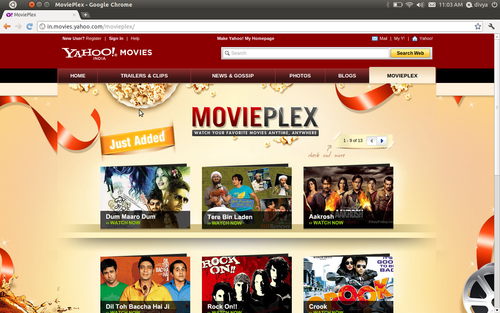 Now its Yahoo that is joining the race to showcase bollywood movies online. Yahoo-Movie-Plex is the place for it. We checked out some movies. Quality is fair and streaming is good. We were not able to find recent movies there for-obvious-reasons. The site is free for all to watch. We could find only 13 movies as of now (or did I miss to click any link to see if there are more ! ) Check them out and let us know what you think.